For the experts, determining the location of the leak is simple. Plumbing companies who offer leak detection use special equipment designated for detecting a leak(s) called “electronic sound equipment.” This equipment consists of three parts: a box, a mic, and headphones. The box has a scale and a few knobs to help plumbers determine the exact location of the plumbing leak in the slab. 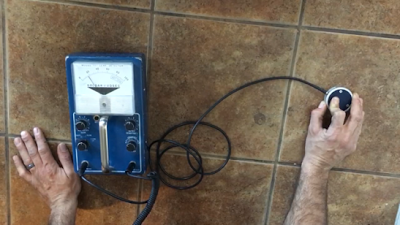 The scale measures sound from 0-100, 100 being the loudest sound. Plumbers then place the headphones over the head and place the mic on the floor near the damage/wet area moving it around until the sound becomes louder and louder. *Please Note: All plumbers have different techniques and skill levels when using electronic equipment, information stated above is only the basics. This equipment is only used to detect leaks within metal pipes such as; copper and galvanized, not plastic. Plastic pipes cannot be detected using electronic sound equipment. However, there are other techniques used to determine a leak in plastic pipes. Not many plumbing contractors offer “Leak Detection” services or perform “Sound Tests.” If you do have a plumbing leak in the slab and you are looking for a plumber who can locate the leak, make sure to ask the company this question, “Do you offer Leak Detection using electronic sound equipment?” Accurate Leak Locators specializes in Leak Detection and repairs of slab leaks. Our goal is to mitigate the water leak and restore the plumbing to pre-loss conditions as soon as possible. Accurate Leak employees are trained to recommend only the most cost effective method of repair saving you money, time and headaches, because we understand choosing/finding an honest and trustworthy plumber is difficult. So, when a leak finds you call Accurate Leak and we will find the leak and fix it. Menifee Plumbing is open 24 hours a day 7 days a week, call us at 951-679-0732.